The Sleuk Rith Institute – a new institution and genocide memorial in the Cambodian capital Phnom Penh – brings together a museum, research centre, graduate school, document archives and research library. The institute will house the Documentation Centre of Cambodia’s one million documents in its archives and, as the largest collection of genocide related material in Southeast Asia, will become a global centre for education and research into the documentation, causes and prevention of genocide. The Institute’s name Sleuk Rith means ‘the power of the leaves’. Cambodian religious leaders have used dried leaves for centuries and scholars to document history, disseminate knowledge, and preserve culture during periods of harsh rule and grave peril. During the 1970s, Youk Chhang, at the age of 15, was a prisoner under the Khmer Rouge and members of his family were victims of the regime. Through his Documentation Centre of Cambodia, he has spent more than a decade amassing details of atrocities committed by the former Cambodian regime, The Democratic Kampuchea (DK), which is also known as the Khmer Rouge. Despite the tragic history explored at the institute, Youk Chhang’s research led to the very considered brief for a building that promoted reflection and reconciliation, and also inspired and innovated. “Cambodia will never escape its history, but it does not need to be enslaved by it. Post-conflict societies have to move on,” he says. The Sleuk Rith Institute will not focus only on the past, but rather seek to create an institute that will also be enlightening; a place for new generations to learn from the lessons of the tragedies of the past while exploring ways to heal, and move forward. The Sleuk Rith Institute will combine a strong educational and outreach programme together with its ongoing work for social justice as well as the commemorative nature of a memorial museum. The institute’s design is organised as five wooden structures that are separate volumes at ground level, but interweave and link together as they rise upwards, connecting the different departments, visitors, students and staff within a singular whole. With an overall footprint of 80m x 30m at the base and 88m x 38m at roof level, the structures range between three to eight storeys. Each of these five buildings will house a different function: the Sleuk Rith Institute – a library holding the largest collection of genocide-related material in Southeast Asia, a graduate school focussing on genocide, conflicts and human rights studies, a research centre and archive to influence national and regional policies and discourse, a media centre and an auditorium that can be used by the institute and the entire community. The architecture of the ancient temple site Angkor Wat, and Cambodia’s many other remarkable Angkorian sites, builds complexity by combining and interlocking a multitude of geometric forms in a formal progression of connected enclosures. As they gain in height and coalesce, the Sleuk Rith Institute’s five buildings define an intricate spatial composition of connecting volumes, generating a series of exterior and interior spaces that flow into each other to guide visitors through the different areas for contemplation, education, engagement and discussion. The design connects the museum, library, school and institute at various levels, allowing different users to interact and collaborate, enhancing their understanding and experience. Yet each of the institute’s functions is also able to operate independently when required. Constructed from sustainably-sourced timber, the primary structure, exterior shading and interior partitions give natural scale, warmth and materiality. The more complex forms have been designed and engineered to be assembled from economical straight and single-curved timber sections with established technologies. The site is located in the grounds of the Boeung Trabek High School in Phnom Penh, south of the city centre. The existing school buildings (now abandoned when the high school moved to its new premises) were used as a re-education camp during the Khmer Rouge regime – as were many schools in Cambodia – making this a fitting location for the Institute: building on the past to educate the future. To accommodate Cambodia’s tropical climate, the narrower lower levels of the institute are shaded by the building’s form, while louvers on the upper levels keep out strong sunshine. Located at the confluence of the Mekong and Tonlé Sap Rivers, the institute’s buildings will be built on raised terraces, to protect from Phnom Penh’s seasonal flooding. Visitors approach the building on causeways above reflecting catchment pools that mirror the building’s form and bring light deep into the internal spaces. As with the catchment pools of Cambodia’s ancient temple sites including Sras Srang and Angkor Wat, these pools – and those on the upper level courtyard and terraces – will be fed by harvested rainwater and are integral to the institute’s water management processes that minimise the impact on the local environment and drainage systems. Entering through the atrium at the centre of the building, visitors are welcomed by exhibits from the Institute’s collection. From here visitors are directed to the museum where exhibitions continue or to the school and auditorium. The auditorium is on ground level while classrooms and professors’ offices are organised around the outdoor courtyard above and continue on upper floors. Above the entry atrium, the Institute houses the Documentation Centre archive, with offices for researchers and Institute administration on the top levels. A bridge is suspended above the atrium to connect the school and library. The building’s passive design – including measures to reduce energy and water consumption while increasing system efficiencies, and the installation of renewable energy sources – will increase its ecological performance. The institute’s form minimises solar gain, and the external shading system will be varied on each elevation to reduce solar gain whilst maintaining sufficient daylight levels where required. Thermal buffer zones protect the sensitive archive and exhibition spaces and further reduce energy consumption. Waste water will be treated on-site via bio-reactors or a natural plant-based wastewater treatment system that can be incorporated within the park. The horizontal roof of the building is hidden from view to house renewable energy sources that are extremely effective in Phnom Penh’s climate: photovoltaic cells for power and a solar thermal array for hot water generation. Plant and air-system heat exchangers will also be located on the roof, maximising the area within the building for the institute’s commemorative, educational, cultural, and community programmes. The institute includes a 68,000sqm memorial park for the entire community with sport fields, urban vegetable garden and fruit orchards, traditional meadows and a forest that will house contemporary Cambodian sculptures, many of these commemorating the women that helped to rebuild the country. The park slopes away from the building to provide further protection against seasonal flooding. The park is landscaped to become a large retention pond during heavy monsoon rains, alleviating the city’s existing flood drainage. The park’s many pedestrian paths link together neighbouring streets that had previously been disconnected, inviting the local community into the heart of the institute. 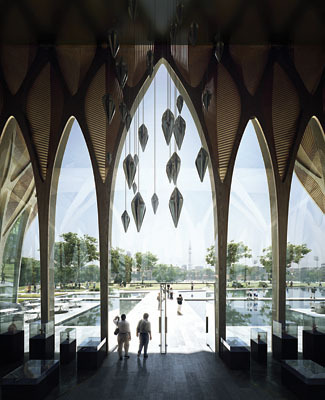 Hadid taught at the AASchooI until 1987 and has since held numerous chairs and guest professorships at universities around the world. She is currently a professor at the University of Applied Arts in Vienna and visiting professor of Architectural Design at Yale University. Zaha Hadid Architects continues to be a global leader in pioneering research and design investigation. Collaborations with corporations that lead their industries have advanced the practice‘s diversity and knowledge, whilst the implementation of state~of-the-art technologies have aided the realization of fluid and therefore complex architectural structures.